At Microsoft's press event on 30 September the audience is expected to see a sneak preview of the next version of Windows, codenamed Threshold. In the following months developers can expect to have an early preview of Windows 10 to play with, and a public release could happen by the middle of 2015. Rumours are surrounding about a new Start Menu. The existence of a Start Menu has been partly fuelled by a particular Microsoft screenshot, briefly shown at its Worldwide Partner Conference in July. Indications suggest this wont be a rehash of the old-style start menu, but something quite new, taking design hints from the existing Start Screen. 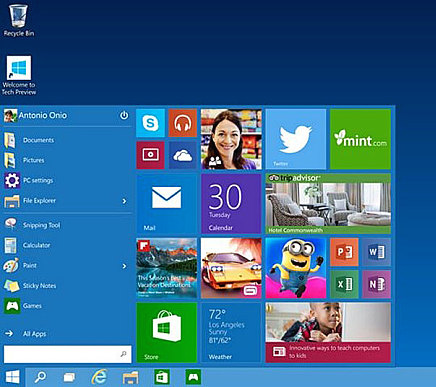 A new Start Menu is likely to exhibit both compact and full-screen configurations. The latter might look rather similar to the current Start Screen. The latest incarnation of the Modern UI is said to feature both interactive Live Tiles and a new Notification Centre. The existence of interactive Live Tiles was reported back in April 2014. An interactive Live Tile allows users to perform a range of app-specific tasks without actually opening the application. Although, in reality, this functionality would only applicable to a limited subset of Live Tiles. Windows 10 might offer different startup modes depending on the host device form factor. This would ensure the most appropriate interface is presented by default. So, desk-bound and laptop devices would obviously go straight to desktop mode. But as yet it's unclear if this would be a single, hardwired mode or whether users would have the option to select the startup mode they prefer. This would be a significant change from Windows 8.1, and one that's sure to please the business community. Virtual desktop functionality has been an integral part of Mac OS X and Linux for many years now. The ability to switch between multiple desktops - each with their own collection of windows - is an important productivity feature for power users. So far Microsoft hasn't gone the down this route. However, with its increased desktop focus Threshold could sport virtual desktop capability. So look out for a new taskbar button and keyboard shortcuts in Windows 10. The Charms Bar has also been the focus of much discussion. Strong indications point to the removal of the current screen corner mouse activation. Yet many applications rely on the Search, Share, Devices and Settings charms. So, it's unlikely they will disappear altogether. But exactly how they'll be accommodated in the UI is unclear. Cortana is Microsoft's answer to Siri. Owners of smartphones running Windows Phone can ask (or type) questions for Cortana's artificial intelligence software to answer. Up to now Cortana hasn't appeared on Windows desktops and tablets. But Windows 10 might be the point when we see a dedicated Cortana Live Tile. Though it remains to be seen if Microsoft retains the famous 'typical dark' interface. Cortana in Windows 10 could offer enhanced voice input features to improve accessibility. And may incorporate an improved interpretation and analysis feedback mechanism. Microsoft might change its current Windows update cycle to a month-by-month one. In this way consumers would receive new and updated features much more promptly. And the whole update process could receive a streamlined makeover. However, enterprise customers generally evaluation new updates before deployment. So monthly updates would put their IT departments under a lot of pressure. And recent events suggest even Microsoft has its own problems with testing.